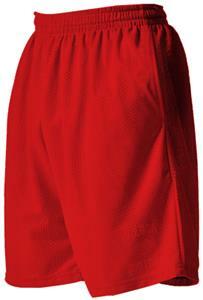 A4 Adult 9" Textured Mesh Shorts with Side Pockets. Body: 100% Polyester Mesh, Liner: 100% Polyester, Moisture Wicking, Odor Resistant, Stain Resistant/Release, Side Seam Pockets, Solid tricot liner. Top Selling Item. Team Orders: I am ordering more than one color or size. Usually ships within 1 to 2 business days. Closeout items cannot be returned or exchanged. Need help? Click here for detailed instructions on how to use this screen. *There may be a color shift between same sizes/colors in your order. *Measurements are approximate and may vary slightly within the same size/color group. *Weights of items may vary within the same size/color group. WAIST RELAXED 23" 25" 27" 30" 33" 36" 39"
Due to color differences in monitors, the colors on this site are for reference only. Please contact Epic Sports if you have any color questions. Nice qaulity and finish for the price.